RP: Great moments in WHAM! 18 Responses to RP: Great moments in WHAM! By the way, this whole series was drawn by a young Will Eisner. The writer and Will Eisner are unpatriotic! AHAHA oh my god I love this! Just… fire hydrant to the face! Uncle Sam or not, that’s what happens when you bring a rock to a fire hydrant fight. Ketchup (8): Contests are every Monday, alternating between character creation and caption contests. Glen Beck would mess his pants if he saw this. Yeah, but Jeff’s not showing us what “King Killer” looked like AFTER he ran out of Fire Hydrants to throw! You don’t think Uncle Sam actually LOST this fight, do you? Oquies (14) Wouldn’t it be Rock, Fire Hydrant, Scissors? Because doesn’t scissors get blunte by rock? Now I wish I had this issue. 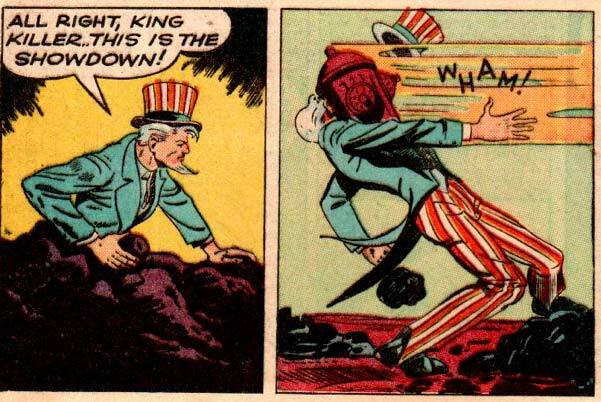 I’ve just gotta know how Uncle Sam made King Killer say “uncle”!. Anyone else see how King Killer could be both the guys name and his ocupation?